A text box will appear under the clock-face. 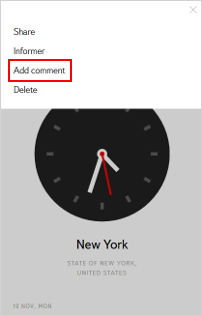 To edit or delete a comment, click on it or choose Add comment in the clock-face settings. To change the appearance, click on Settings. Note. The shift from daytime to nighttime is displayed automatically on analog clock-faces. Hover your mouse pointer over Share.